Server Products Twin-FS-4-Plus-87710, Twin Merchandiser Soup Warmer (2) 5 Qt. Capacity. Features Include: Stainless Steel, water-bath soup warmers with 5 quart inserts. NSF listed rethermalizers - quickly heat to safe serving temperature. For accurate, even heat, a temperature-sensing thermostat and wrap-around heating element is dedicated to each inset to serve food at its proper serving temperature. Serve superior flavor and texture from the first serving to the last - unique hinged lids retain and return moisture to your food. Counters stay clean and sanitary - hinged lids stay upright during ladling. 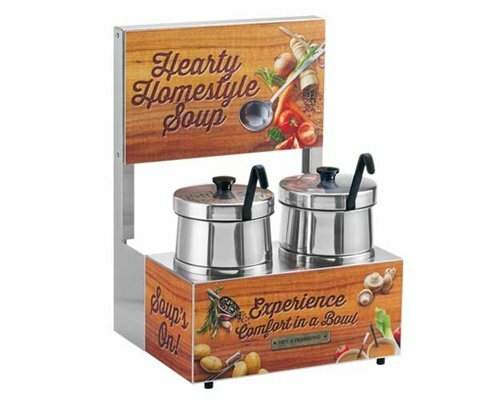 New soup station with merchandising graphics will enhance your soup program. Available in twin and triple configurations. If you have any questions about this product by Server Products, contact us by completing and submitting the form below. If you are looking for a specif part number, please include it with your message. Commercial 110V Catering Hot Box Food Warmer w/ Water Tray 24"x24"x24"